Customer communication – now in French! One of the great strengths of the Online Translation Manager (OTM) is the adaptability of its interface to communicate with clients in local markets. As increasing numbers of language service providers and corporations have adopted OTM as their platform for secure project management, job handling and delivery, the modules for correspondence and the confidential client portal have been localized in a number of languages: English, German, Spanish, Catalan, Dutch, Portuguese and Finnish. Now LSP.net partner FILOGIS TRADUCTION has added French to the client interface. Standard correspondence templates for quotations and invoicing, project schedules and notifications as well as deliveries will improve the ease of communication with your French clientele, who can also access their deliveries and project-related documents conveniently in their native language. As with all important communication modules in OTM, the templates can also be adapted to suit your individual style preferences. Localized communication is merely one aspect of the OTM philosophy of best practice, with reliable infrastructure, confidentiality and legal security foremost in its design. For more information on the benefits of this platform for language service management, see the information page for the Online Translation Manager. 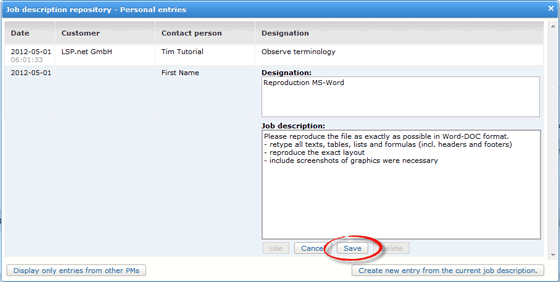 The new OTM feature "Job description templates" is very helpful if you manage projects with complex or numerous jobs. 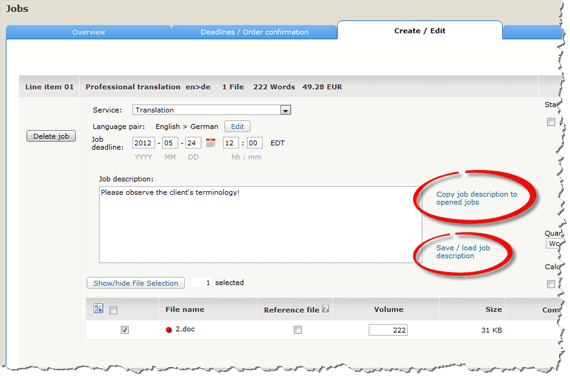 In a project with numerous target languages, you can copy one job description text to all other jobs with just one click. Any job description text can be saved as a template. Templates can be edited or deleted. If you need a certain template, you can load it from the repository. Load a text from your stored templates or templates from co-workers in your company.